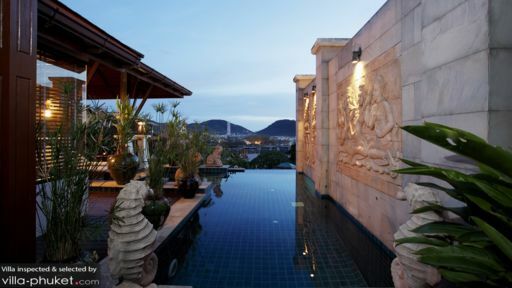 Villa Cattleya 5A is a two-storey vacation residence that exemplifies the fluid combination of traditional Thai architecture and contemporary tropical luxury. Interiors are appointed with beautifully crafted as well as elaborate wood furnishings along with lavish, modern pieces. Amenities are distinctively of hotel and resort grade – for the complete ease and fun of each and every guest. Erected atop a hill ascending from Patong Beach, Villa Cattleya 5A creates for you a well-deserved break with an exotic and scenic appeal. 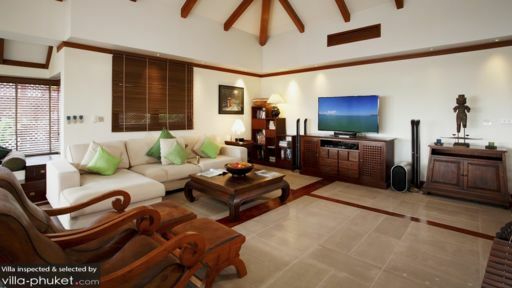 The villa has two bedrooms – both are on the villa’s ground floor. These bedrooms have four-post, draped, king-sized beds, as well as dedicated bathrooms with fitted bathtubs and rain showers. These bedrooms open out to a shared and furnished covered balcony with marvelous ocean views. Bordered by a wall – adorned with carvings depicting traditional figures – alongside the villa’s second floor is a plunge pool. Give in to its mesmerizing, crystal clear waters which magically creates the illusion of flowing out to the Andaman Sea. From the water, you can lounge on cushioned, wooden pool beds on the covered balcony. As part of the L’Orchidee Residence complex, Villa Cattleya 5A gives you exclusive access to the estate’s swimming pool which has a shallow portion for kids. On the airy second floor of the villa – indoors – is the living area with its long couches as well as easy and reclining wooden chairs all facing a widescreen TV. Here, you can all gather for the much-awaited next episode of the newest hit series. Or, for a rerun of your best loved classic film. There are two dining areas. The indoor dining area – with its wooden table that seats eight – is at the center of the indoor space. While the alfresco dining area – with its round, wooden table that accommodates six – is out on the second-floor covered balcony. Wherever you choose to dine, you can all get a taste of authentic local cuisine – as well as international favorites – dished out by the resident chef from the fully-equipped, ultra-modern kitchen beside the stairway. You’re also entitled to use the estate’s gym free of charge – so there’s really no excuse not to do your fitness regimen even while you’re away. On duty to deliver the villa’s everyday services is a staff headed by a manager backed by a personal guest assistant, a housekeeper, a pool attendant, a gardener and a security corps. In addition to the chef, a babysitter, a driver, a laundry helper and a spa therapist may, upon your request, be called in. Their services will be charged separately however. Scooter, car and boat rentals are also available. Among your booking’s inclusions is shuttle service to and from your villa, as well as from and to the estate’s main entrance. 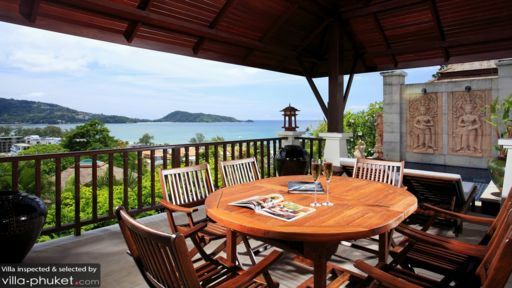 Villa Cattleya is situated in Patong – a busy beach town along Phuket’s western shoreline. Walking distance from the villa is Patong Beach – Phuket’s major attraction. After exploring its three-kilometer stretch, go sunbathing and snorkeling, as well as join the beach soccer and beach volleyball games at Freedom Beach. Then, go for a swim at Paradise Beach where, on the night of a full moon, throws Phuket’s biggest beach party – the Full Moon Beach Festival. You certainly will want more water fun. So on another day tour, drive to the Phuket Wake Park for some wake boarding, and to Surf House Patong for some surfing lessons. Also include in your itinerary go-kart racing at the Patong Go-Kart Speedway and some Muay Thai action at the Patong Boxing Stadium. Go on a nature trip on your next day out at the Flying Hanuman where you can ride a zip line above Phuket’s rainforests, and at Kathu Waterfall where you can embark on a cool mountain trek. You must also get a feel of Soi Bangla – Patong’s lively party zone, as well as Simon Cabaret’s extravagant shows. The villa's view was great and well-equipped. Located up the hill but fortunately there was a 24hrs tuk tuk service. One of the aircon at the living hall malfunctioned on the 2nd day and the villa was like an oven. No alternatives was provided by the management on this hence was rather disappointed. Utilities seems a tad too expensive. Checked in at Sunday almost closed to 11pm and checked out on tues 1.30pm and utilities cost about 2800baht.